The senior police officer leading the investigation into the disappearance of a 63-year-old woman from Herefordshire last month, has today confirmed that fresh searches are to be carried out in and around the village of Orleton in an attempt to find new evidence that might help establish her whereabouts. Police have confirmed they are conducting further searches for Alethea Taylor Mrs Alethea Taylor – who is described as being white, around 5ft 7inches tall and as having short, dark but slightly greying hair – was last seen at around 8.30am on Thursday 19 January when her husband left their home in Orleton for work. There was no sign of her when he returned home at 4pm. With committed assistance from more than 80 local residents, West Mercia Police teams – including dog handlers – scoured the village and surrounding countryside in the days following Alethea’s disappearance looking for clues relating to where she had gone. In addition, members of the Severn Area Rescue Association (SARA) focused their efforts on streams and other water courses, while the Longtown Mountain Rescue team also brought their dogs to help with the search. Unfortunately, despite the best efforts of everyone involved, no trace of Alethea was found. “We have been working with the NPIA (National Policing Improvement Agency) in relation to the ongoing investigation into the disappearance of Alethea Taylor and I can confirm that further searches will be taking place later this week. “The searches will involve the use of air support and ground support teams with specialist search dogs and will focus on selected areas in the countryside around the village. “Due to the passage of time we are now extremely concerned for the welfare of Mrs Taylor, as she has now been missing for over 4 weeks. Judge Robert Juckes QC who gave him a life term with a recommendation that he should serve a minimum of 22 years before being considered for release. A man who murdered a pensioner while burgling his home at Rednal, North Worcestershire, was today (Monday, 27 February) given a life sentence when he appeared at Worcester Crown Court. Cory Youlden broke into the home of 83-year-old Paul Cox in June last year (2011) and strangled him to death before taking keys from the body and stealing his car from the driveway along with groceries and a small amount of cash. Youlden, aged 23 (Date of Birth 18/6/1988), care of HMP Hewell and formerly of Birmingham, appeared for sentencing before Judge Robert Juckes QC who gave him a life term with a recommendation that he should serve a minimum 22 years before being considered for release. Victim Paul CoxYoulden had initially denied the offence but changed his plea to guilty at a hearing earlier this month. He had previously admitted burgling Mr Cox’s home at Waseley Road on the same occasion on 3 June and stealing his Ford Focus which was found burned out in Erdington, Birmingham, two days later (5 June). He was given concurrent sentences of five years each for the burglary and the car theft. Detective Chief Inspector Paul Williamson, who led the investigation for West Mercia Police, said that Mr Cox lived alone and was just days short of his 84th birthday (7 June) when he was murdered. Mr Cox was worried about being burgled following previous break-ins at his home and slept downstairs in a chair in a living room at the back of the house. He was attacked when Youlden, then living a ten-minute walk away in Frankley, broke in during the night through a front window. DCI Williamson said: “Mr Cox was a frail old man who was defenceless and stood no chance against a man some 60 years younger. He was strangled by Youlden and also received head injuries during the assault. Police were alerted next morning by a concerned neighbour who noticed a smashed window at Mr Cox’s property and that his car was missing from the driveway. A Major Incident Room was set up by detectives at Redditch Police Station and details of the stolen car were circulated as part of a media appeal. That led to a woman coming forward the following day, Saturday 4 June, to say she knew Youlden had been in possession of the car. Youlden had in fact already sold on the vehicle and it was found burned out in a car park at The Gardens in Erdington on Sunday, 5 June. DCI Williamson said: “We launched a manhunt after Youlden went on the run and later that same day (5 June) he was caught by police on a train at Bristol’s Parkway station. deceitful, callous and calculated. He desperately tried to cover his tracks by cleaning up at the murder scene but we were still able to establish he had been there through our forensic work which included matching fingerprints and footprints to him. He also had a cut on his arm which was consistent with him climbing through the broken window at Mr Cox’s house. “His deceit carried on after his arrest when he implicated two other people who were arrested on suspicion of murder but later eliminated from the inquiry. “Youlden has never shown any remorse and even lied to his partner at the time to conceal his involvement. However the weight of evidence stacked up against him was overwhelming and finally he realised it was futile to deny responsibility for the death. “The tragic and brutal killing of a vulnerable man who was loved by his family and popular with his neighbours was all the more senseless because Youlden gained very little from his crime. “It was a despicable offence and the seriousness of that is reflected by the sentence. He fully deserves to be behind bars for a very long time. “Our heartfelt sympathy goes out to Mr Cox’s family who have lost a father, grandfather and brother. They miss him and have been deeply affected by this. We hope that the fact that his killer has been brought to justice provides them with some small measure of comfort. A statement by Mr Cox’s family said: “Paul Cox was found murdered at his home on 3 June, 2011, four days before his 84th birthday. Before his death Paul had been living independently, and was still able to drive and do his own shopping. Still able to enjoy life, have a pint, watch sport on TV and spend time with his family. “There is no reason to think that he would not be with us now if it was not for the vile actions of another person. “Paul was the victim of a brutal, cowardly and senseless crime carried out by an individual 60 years younger. The perpetrator gained nothing from taking a human life but his son and daughter lost a loving father, his granddaughter and grandson lost their devoted granddad, a brother lost his last surviving sibling, nieces and nephews lost their uncle whilst others lost a loyal, true and caring friend. It’s they who feel they have the life sentence. “The family would like to thank West Mercia Police for their commitment to finding Paul’s murderer and bringing him to justice. Mr Cox”Cory Youlden was apprehended swiftly and has received all the consideration that the Law has to offer after eventually pleading guilty to murder. It is hoped that the custodial sentence passed by the court today will ensure that he takes responsibility for what he has done and is unable to harm anyone else for a very long time. “As Paul’s family and friends continue to try to come to terms with what has happened they ask the Press and other media to respect their privacy at this most difficult and distressing of times. Police are appealing for witnesses and information after a man received serious facial injuries in Redditch. It happened between 11pm on Saturday, 25 February and 5am on Sunday, 26 February in Park Way, near Church Hill. The victim, a man in his late teens, was walking along Park Way when he was approached by two males who asked if they could borrow his mobile phone to send a text message. Having lent them his phone, they walked off with it and he tried to get it back. Some hours later he was discovered by police officers with injuries to his jaw and face as well as a number of cracked teeth, and was in a confused state. He was taken to the Worcestershire Royal Hospital for treatment and has since had surgery on his jaw. He is currently recovering in hospital. Witnesses or anyone with information are asked to contact DC Hewitt at West Mercia Police on 0300 333 3000, quoting incident 177-S-260212, or ring the independent charity Crimestoppers anonymously on 0800 555111. If your not on benefits then the Limitation Act 1980 would apply where appropriate to prevent court action being taken to recover the debt. A number of people asked if i would do a story on the DWP as they have been chased for a loan they had taken out 15 0r 20 years ago whilst claiming benefits. So i put in a FOI and asked what the rules were as most debts are statute–barred after 6 years. Thank you for your Freedom of Information request received on 3 February 2012. You asked for the rules when someone owes DWP money for a debt or loan that is over 6 years old. The time limits for taking civil action to recover debts in England and Wales are prescribed in the Limitation Act 1980. Different legislation applies in Scotland. The Limitation Act prevents civil action being taken against a customer where the last acknowledgement of the debt or effective recovery was more than 6 years previously. In relation to DWP debt however, the Act does not prevent DWP from continuing to seek recovery by any other means, including deductions from future benefit payments or instructing our private sector partners to pursue repayment on our behalf. However, where the customer is no longer in receipt of a benefit, the Limitation Act would apply where appropriate to prevent court action being taken to recover the debt. The Department’s policy is to continue to seek recovery of any outstanding overpayment or Social Fund debt, regardless of whether or not recovery of the debt in court would be time-barred under the Limitation Act. Although Court action may not be possible, the customer may still be invited to repay. Where a customer returns to benefit at any time, deductions from that benefit will be taken to recover any debt that remains outstanding. If you have any queries about this letter please contact Dean Francis on 0113 232 4095 quoting the reference number above. If you are not happy with this response you may request an internal review by e-mailing freedom-of-information-request@dwp.gsi.gov.uk or by writing to DWP, Central FoI Team, 2nd Floor The Adelphi, 1-11, John Adam Street, London WC2N 6HT. Any review request should be submitted within two months of the date of this letter. A fraudster at the helm of a criminal gang that defrauded high street banks out of almost £8 million by taking out mortgages on properties they didn’t own has been jailed. Mohammed Asif Younas, 50, was handed a seven year prison term earlier today (16 February 2012) at Southwark Crown Court. He had previously pleaded guilty to conspiracy to defraud and conspiracy to money launder in November 2011. The court had heard how Younas, operating under the alias Mahmood Ali, was director of bogus Montague Mason Solicitors. He submitted false paperwork to Birmingham Midshires and Abbey banks in connection with 33 fraudulent mortgage applications in a two month period (October to December 2008). His fellow gang members had previously identified suitable properties across the south-east to use for false mortgage applications – with the homeowners unaware of the crime. The fraudulent mortgages were finalised when false paperwork was completed by the solicitors, and signed by Younas, including the Certificates of Title requesting the banks release the funds. Once the deals were signed-off and the funds transferred, the stolen money was quickly transferred from the solicitor’s account into a network of bank accounts,controlled by Younas and the rest of the gang. The money was then withdrawn in cash. Det Supt Bob Wishart, of the City of London Police, said: “Younas is a sophisticated fraudster who hid behind an alias to con banks and evade police. “His meticulous planning and precise execution of this fraud ensured maximum gains– but the scale of his crime resulted in the lengthy sentence passed today. “Mortgage fraud damages the UK’s economy and therefore affects us all. As the National Lead Force for Fraud, we actively go after people who orchestrate and commit this crime and continue to work with the banks to ensure people can have faith in the integrity of the mortgage system”. In March 2009 Abbey and HBOS asked the City of London Police to look into the activities of Montague Mason Solicitors, based in Essex. Working in collaboration with the two banks, detectives uncovered an extensive criminal network that led them to execute search warrants at addresses across the UK in June 2009. Four men – Khawar Khan, Imran Mirza, Nadeem Mirza and Farhan Khan – all part of the same gang as Younas, were arrested during the warrants. They were subsequently jailed having pleaded guilty to numerous fraud related offences in December 2009. But ‘Mahmood Ali’ remained elusive, until detectives working with the DVLA were able to match ‘Ali’s’ driving licence image to one with the name of Mohammed Asif Younas. That licence provided legitimate. Detectives now had Younas’ home address in Croydon and he was quickly arrested. On searching Younas’ home, detectives recovered more false documents and items linking him to his alias and as a result he was charged with numerous fraud offences. Younas was sentenced to seven years imprisonment for conspiracy to defraud and four-and-a-half years for conspiracy to money launder, to run concurrently. 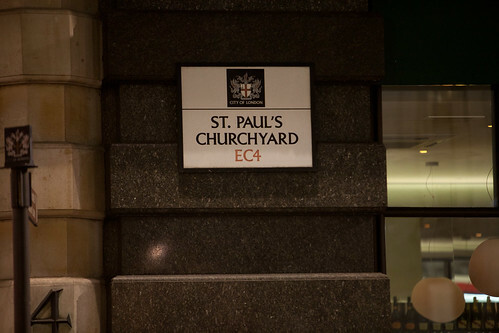 Police arrived in numbers with a hundred bailiffs to enforce a court order to evict the protest camp at St Paul’s Cathedral after legal action by the City of London Corporation. ‘Mr Justice Lindblom had said the City’s action was “lawful and justified”. But lawyers for the protesters said the City’s action was “more extreme and more draconian than was necessary”. Occupy London group, which has been campaigning against corporate greed, set up the camp outside the cathedral, their first in the capital, on 15 October. The local authority sought a possession order from the court after the group ignored an order to clear its tents from the public highway. The corporation said in a statement on its website that it has “begun to enforce the High Court orders for the removal of the tents and equipment outside St Paul’s”. It went on: “We regret that it has come to this but the High Court Judgment speaks for itself and the Court of Appeal has confirmed that Judgment. “High Court enforcement officers employed by the City of London Corporation are undertaking the removal with the police present to ensure public safety and maintain order. We would ask protesters to move on peaceably. The High Court found in favour of the City of London Corporation in the case against the camp on January 18, 2012.